In 2002, Capcom released the so-called ‘REmake’ — an updated version of the original Resident Evil that was essentially the exact same game with better graphics. It was the absolute apex of fixed-camera presentation, but just two years later RE4 would render it irrelevant. In contrast, 2019’s Resident Evil 2 has rebuilt itself from the ground up using the same locations, characters, and story, but slides them into a modernized experience. The result is that it successfully recreates the feeling of playing the original from 1998 while delivering smart updates at the same time. 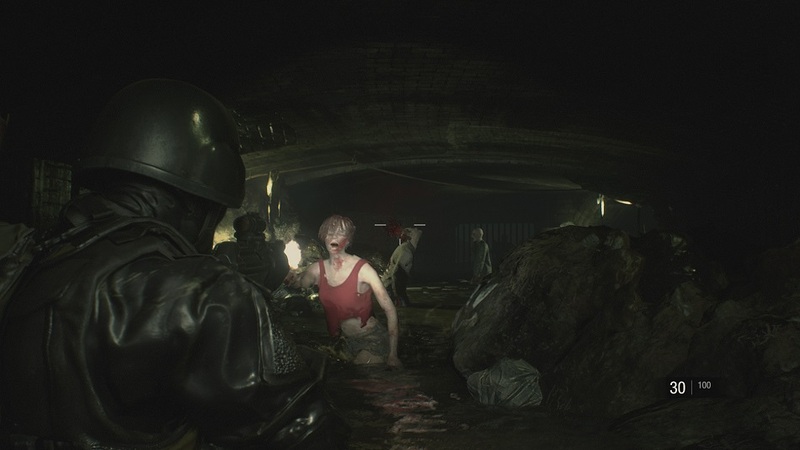 The REmake was a tribute, but this version of Resident Evil 2 is a rebirth. 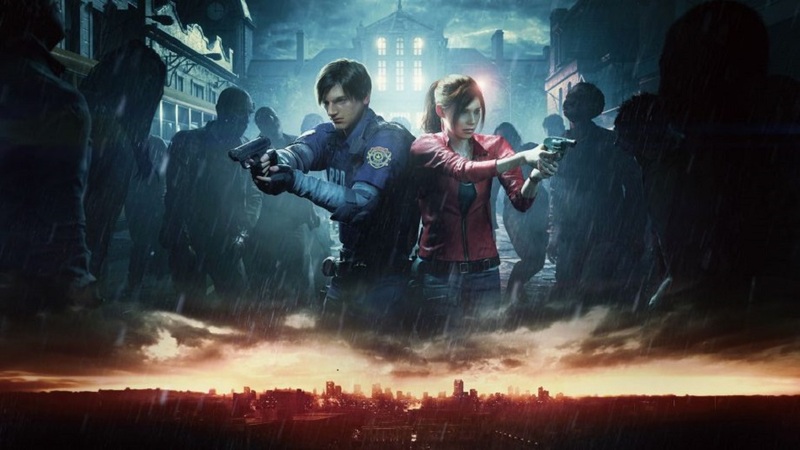 For those not coming to RE2 with a longstanding familiarity (surely plenty of people since it’s been 17 since the original release on PS1) Resident Evil 2 follows Leon Kennedy and Claire Redfield, two youths who find themselves trapped inside the zombie-infested Raccoon City and have to fight their way to safety — a journey that will wind up revealing all of the dirty secrets hidden beneath the carnage-strewn streets. Players start by selecting either character, then set about exploring an ornate and labyrinthine police station, gathering keys to unlock doors and various items to complete objectives. They’ll also spend a significant amount of time juggling inventory space to ensure that they have enough ammo and health items to survive inevitable encounters with the hungry dead. In one of the RE2‘s biggest nods to modern accessibility, an autosave system has been added that creates a checkpoint every time something major happens. Using the original manual save rooms is now completely optional. 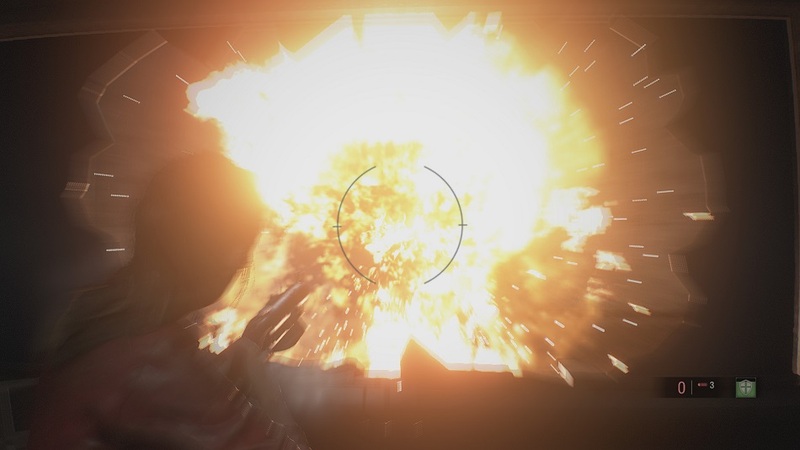 While the change to a traditional third-person camera (the original offered fixed camera angles) isn’t as great a transformation as RE7‘s first-person experience, it was absolutely the right choice for the intensely combat-focused RE2, as the game is packed with vicious, fast-moving foes. Being able to easily track them around a widescreen view is absolutely integral to survival, and the combat is a melange of the best ideas the series has ever had — the direct aiming and free movement was snatched from RE6, and the moddable weapons and ammo crafting were grabbed from RE2 and RE3 respectively. Most vitally, though, defense items have made a triumphant return from the REmake! Most of the enemies focus on grabbing the player, and can do huge amounts of damage if they’re successful. Instead of the ability to quickly dodge or block incoming attacks, players can pick up a number of limited-use defense items. When grabbed, the player is given a prompt to tap a button that results in defensive maneuver like a brutal stabbing, or jamming an explosive device into a creature’s mouth, depending on what they have equipped. It’s a great system for balancing out the often-severe difficulty — players get a second chance when they make a mistake, but they’re always reminded that those extra chances are limited in number. Enemies look and behave fantastically well. Zombies shamble and stumble around, easy to stun but hard to kill without a decapitation. Lickers move like lightning, and writhe with strange animations. 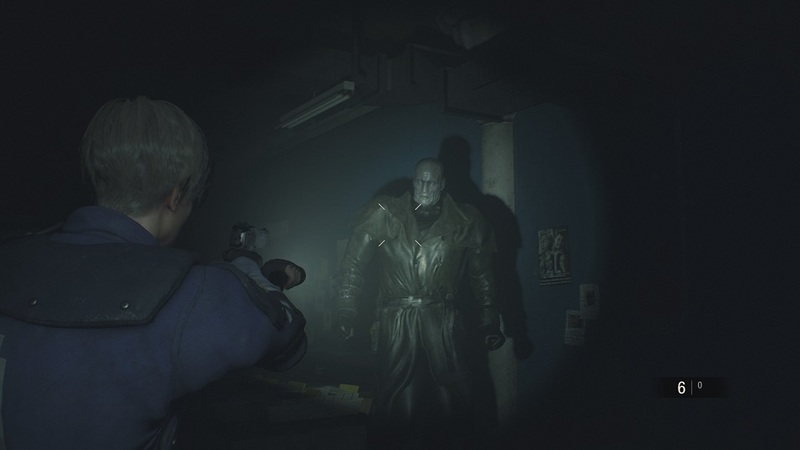 However, RE2‘s most fantastic foe is easily Mr. X, a trenchcoat-wearing giant who was originally relegated to a player’s second run-through. His part has been beefed-up considerably, as he now bedevils both characters through nearly half of the experience. Now that modern tech has done away with loading screens, this imposing hunter is free to chase players from room to room, with few places being truly safe. Every time his heavy footsteps become audible, the tension ratchets up considerably. One of the main selling points of the original RE2 was the ‘zapping system’, which let one character take on the main plot, followed by the second character playing a complementary version with different bosses. That concept has been recreated here, but only somewhat — this time Leon and Claire each have distinct storylines and exclusive areas, but with one exception, they fight the same bosses in the same places. 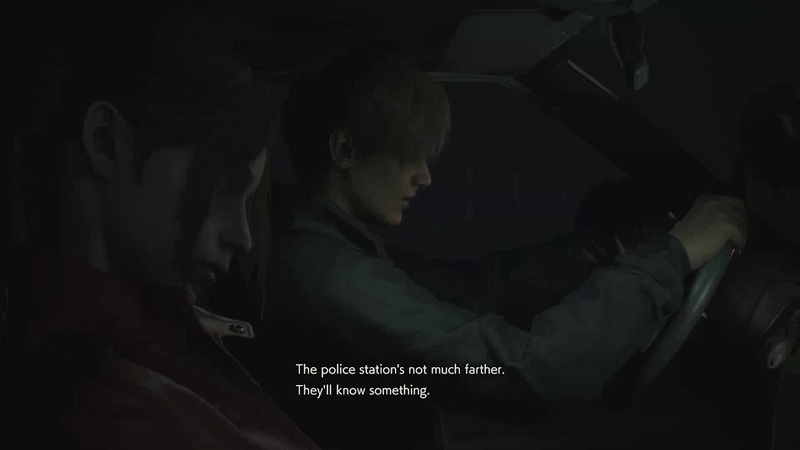 This isn’t a huge problem since Leon and Claire feels radically different from each other, but the biggest impact is on the storyline. Over the course of two playthroughs I saw characters die and then come back to life, I saw a room get destroyed twice by the same climactic boss fight, and I saw two people get trapped in the same room at what must have been the same time, but magically, neither of them ran into one another. While it’s too bad the developers weren’t able to make the twin storylines mesh more organically as they did back then, the biggest oversight is keeping Leon and Claire apart for almost the entire campaign. The two characters meet at the start, get separated immediately, chat once through a locked fence, and then don’t run into each other again until the game is over. All of the voice actors do a good job, and the realistic, expressive models allow for legitimate moments of emotion, but because the two leads spend essentially no time together, their flirty camaraderie seems badly out of place. With just one new area per character, this RE2 isn’t much larger than the original was. I was able to get through my first playthrough in around six hours, with my second taking just three and a half. Alternate costumes and special weapons are locked away behind low completion times and playing on hard difficulty, though — there’s enough here to justify half a dozen replays, even if it’s just to test out how all of the weapons work on the different enemies. I’ve played through it four times so far, and haven’t yet tired of the combat. Resident Evil 2 is an exceptionally good survival horror game that looks fantastic and plays like a dream. It also proves that the Raccoon City police station was one of the greatest videogame maps of all time, as the concept of letting players take on two different halves of the same story is just as brilliant now as it was back then. Even concerns about modern players’ lack of interest in old-school inventory management (a notorious complaint for most of the series) have been addressed, with item boxes now sprinkled liberally throughout and an expandable inventory that can hold up to 20 items. Disclosures: This game is developed and published by Capcom. It is currently available on PS4, XBO, and PC. This copy of the game was obtained via publisher and reviewed on the PC. Approximately 20 hours of play were devoted to the single-player mode, and the game was completed multiple times. There are no multiplayer modes. Parents: According to the ESRB, this game is rated M and contains Blood and Gore, Intense Violence, and Strong Language. It’s a zombie game, and one of the most explicitly gory ones at that. There arfe exposed entrails, torn-off pieces of flesh, and the second-most upsetting head explosions I’ve ever seen. Also, there’s plenty of swearing and plenty of children getting killed. Keep kids far from this one. Deaf & Hard of Hearing Gamers: Unfortunately, you will have a great deal of trouble playing the game. Being able to hear the groans, skittering, or thumps of approaching enemies is vitally important to gameplay, and there are no visual cues letting you know when those sounds are happening. If you stick to easy mode you’ll probably be able to muscle through it, but be prepared to get unfairly grabbed A LOT. All dialogue is subtitled. The subtitles cannot be resized. Remappable Controls: Yes, this game offers fully remappable controls on the keyboard. The mouse controls aiming, shooting and camera movement, with the keyboard handling movement and menu navigation. All keys can be rebound. 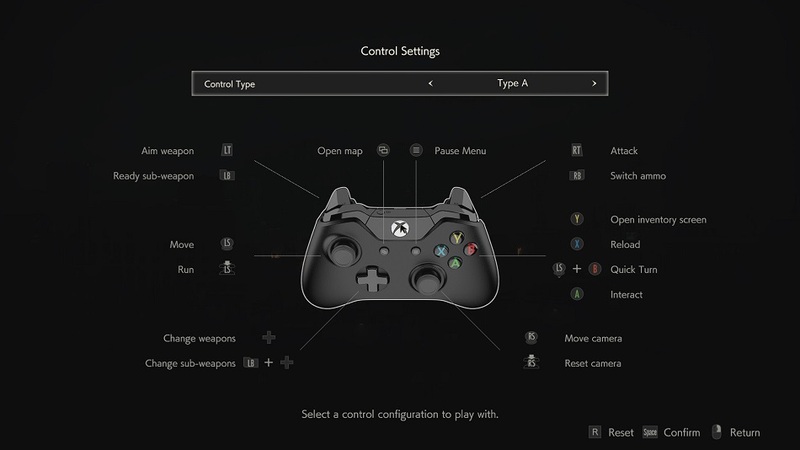 On the controller, the player must select from a few control options.